Lily here gettin’ in the mood for Catmas, hence the festive head gear. We’re having our human check out some blog hops so today I’m doing our first Friendly Fill Ins. If you want to join, make sure you add your link at McGuffy’s Reader. You can also answer in the comment section. The Tribe of Five would love to learn more about you so join the blog hop or answer in the comments. 1. The best part of last week was _______________________. 2. The worst part of last week was ____________________. 1. The best part of last week was spending more time with our female human. It wasn’t such a great week for her because she missed a step and fell, smashing her knee. She was home for two days which meant more petting and cuddle time for me (lest you think I’m cold-hearted we gave her lots of love, we felines are very good nurses). 2. The worst part of last week was that our female human hurt her knee (see #1) but she’s doing much better now. 3.Watching the deer pass by and try to get the apples off the trees will be a winter project that I will be working on. This photo is Oliver watching the passing deer. 4.A holiday gift I always buy for someone is absolutely nothing. I’m a cat and although I am a hard working, blogging, journalistic cat, I receive no salary so the best gift I can give my humans and the rest of the Tribe of Five is the gift of my presence. This is a picture of me gracing my family with my presence. 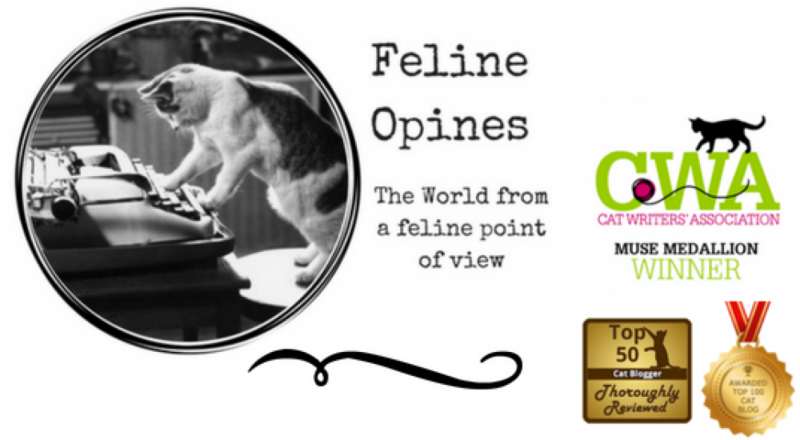 This entry was posted in cat behavior, Cat blogs, cats and tagged cat on rocking chair, cat watching deer, felines opine on life, Friendly Fill ins, McGuffy's Reader, The Tribe of Five by Feline Opines. Bookmark the permalink. Those were terrific answers and I really liked #4! Pingback: Friendly Fill Ins Week 83 - Baptize A Cat? Thank you for participating in the fill-ins, nice answers- except for your human getting hurt. Your presence is present enough for your human 🙂 Have a nice weekend! Heh, heh, I prefer to see the white stuff from the inside if the house! Why thank you! It is my favorite chair. I have to wonder where you live to have apples on your trees in the winter! It would be fun to watch the deer. I hope your human is all healed up! Thanks for joining us! Hugs. Apples are still hanging on ( humans couldn’t harvest them all because the tree is on a steep hill). Our human is still hobbling but I think she’s better. I look forward to getting to know you all better. Hugs. Oh no! Hope the female human is feeling better. Take good care of her! The female human sends thanks-she’s still hobbling about but we’re all giving her extra purrs and Head Bonks .